In their close-knit, small-town circle, Waverly is the talented one. With a gift for dance and perfect technique, she had the opportunity to become a world-class ballerina. But Waverly’s empathy is a curse she cannot bear. Only one thing brings her peace: music. This is a lightly paranormal, sweet and steamy lesbian romance about two good witches healing their hearts together. 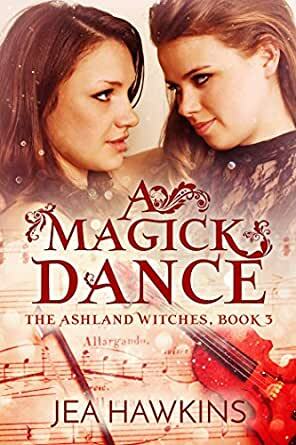 A Magick Dance is Book 3 in the series, but can be read as a standalone. The third installment in The Ashland Witches series focuses on Waverly’s journey to overcome her crippling empathy and also the road to love with Lark. Lark is able to provide a shield for Waverly it she decides that she cannot rely on Lark and needs to learn to control her empathy with the help of Crystal, a fellow witch with the gift. Waverly prevails and so does love. This was a steamy read with a happily ever after. One shared soul, a pregnancy, the Swan Lake, emotional complications and it is about fear. Don't ever let your fear rule you but face it. So true! Gosh, this installment was amazing and I'm very curious about the last book in this series. 5.0 out of 5 starsPerfectly delightful! Just perfect! It isn't always easy being a witch and Waverly has had a really hard time of it for some years. Her "gift" is empathy and having others feelings inside yourself all the time is not good. Lark loves her and wants to help but is Waverly ready for help? Their journey together was just so real and romantic. Both ladies are so ordinarily human that I found myself totally immersed in their story. Wonderful 3rd book in the series and can't wait for the next. Thank you, Jea, for another story so delightfully told! I love the Ashland Witches series and now reading Waverly and Lark's story I love the series even more. Waverly has been one of my favorite characters from the beginning so finally getting to read her story and see her happy makes me smile. As a musician and dancer in my younger days, I really felt like I could understand the two leading ladies in this story. The chemistry between them is fantastic and the vague hints of Avery having something different going on in her life were just the right amount to whet the appetite for the next book in the series.